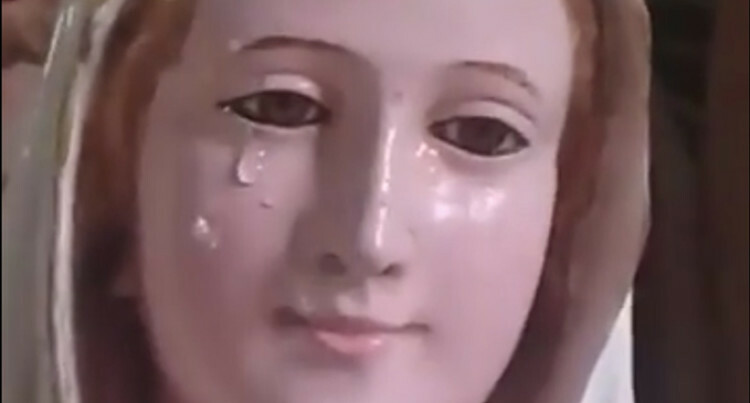 “Tears” flowing down Mary’s cheeks is a significant symbol of blessings for Catholics. They are calling it the Taveuni miracle in Wairiki Catholic Parish in Taveuni – a ‘weeping’ statue of the Virgin Mary, the Mother of Jesus Christ. People from different faiths including Methodists and Hindus and the business community had flocked to Wairiki, said to be the largest parish in Fiji with 7000 members. “Tears” flowing down Mary’s cheeks is a significant symbol of blessings for Catholics. It has been stored in bottles and the cloth used to wipe the tears have been kept to bless people. The travelling statue came from the Vatican, Catholic sources claim, and it has been in Wairiki for three months since it arrived in the country. It left Wairiki on Sunday in a boat for an unknown destination. When Mary was carried to the boat “she was crying again and the statue suddenly became heavy” said one witness. It is understood that the tears phenomenon is being investigated by the church to establish its authenticity. Reports of a weeping Virgin Mary statue are not uncommon. In July last year, in New Mexico, a similar incident was reported there. The liquid on the statue was olive oil and balsam – the same mixture found in Taveuni . It is used for certain Catholic rituals after being blessed by a bishop. And when this happens, the local bishop sometimes steps in to investigate as it has now happened in Taveuni to see if there is a possibility of trickery. Watch the video below taken by Tama Senibua at Wairiki, Taveuni on Sunday April, 7, 2019.